Benjamin Britten (1913-76) was a key figure in English music of the entire twentieth century and ranked among the most outstanding composers of his time. One of his most famous works is A Ceremony of Carols, Op. 28 for high voices and harp. On 4 May 1942, only a few weeks after returning from America, Britten wrote to his friend Elisabeth Mayer that during the journey he had finished a Hymn to Saint Cecilia and also Christmas carols. The first performance of A Ceremony of Carols was given in December 1942 in the library of Norwich Castle, by female voices of the Fleet Street Choir under choirmaster T.B. Lawrence with Gwendolen Mason playing harp. The work originally consisted of seven numbers, but gradually this was expanded to eleven, in which form the work was first performed on 4 December 1943 in London’s Wigmore Hall by the Morriston Boys’ Choir with the legendary harpist Maria Korchinska, conducted by the composer himself. Soon A Ceremony of Carols became very popular: it took a place among the most significant English choral works and is one of Britten’s most often-performed compositions. Its enormous success led the Boosey & Hawkes publishing house to request an adaptation of the whole work for mixed chorus, which task was accomplished with great success by an older colleague of Britten, the English composer Julius Harrison (1885-1963). In this form, with the harp part unchanged, the work was first published in 1955. The texts of this work are taken from the most varied traditional English carols dating back to the fourteenth through the sixteenth centuries. 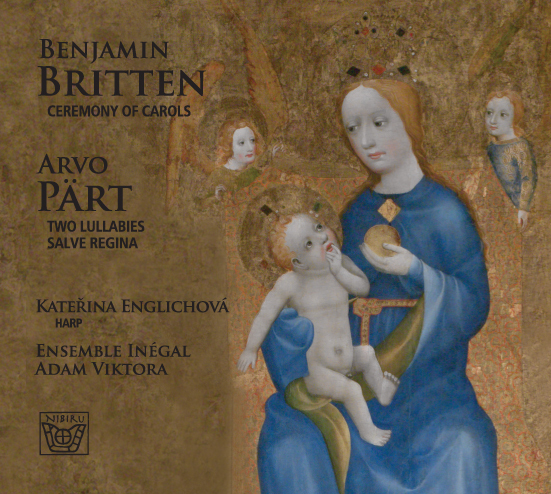 Britten achieves an impressive effect via a remarkably simple musical language, a sober Neo-Classical texture, and detailed work with timbre and emotional expression. The work opens with a ‘Procession’ – the plainchant antiphon ‘Hodie Christus natus est’ accompanied by harp – which is repeated at the end as a ‘Recession’. Apart from the vocal numbers, we also have here a unique ‘Interlude’ for harp alone in which the timbral possibilities of this instrument are employed with great skill, sometimes in the most delicate dynamic shadings. Britten achieved an overall sense of progression as well as effective contrast using many forms of polyphonic texture, further enhanced in Harrison’s adaptation by the very rich timbral and expressive possibilities of male voices. We might mention the enchantingly beautiful juxtaposition of male voices in six parts against female voices in four parts in the lullaby ‘Balulalow’, and an impressive example of canonical work in the wild whirl of voices portraying ‘This Little Babe’ – who fights with tears and vanquishes Satan. The strength of Britten’s legacy was a great inspiration for many other composers, among them the Estonian Arvo Pärt (born 1935), who a year after Britten’s death composed his Cantus in Memory of Benjamin Britten for strings and a bell. Starting in the late 1960s Pärt focused on study of Medieval and Renaissance works by masters of vocal polyphony from the fourteenth through the sixteenth centuries, which became an important source of inspiration for him on which he built his own unmistakable musical language. Over the course of time he focused increasingly on sacred compositions, especially after his emigration from the Soviet Union in 1980. All of his pieces included in the present recording were written in 2002, thus a full seven decades after Britten’s Carols. The hymn Salve Regina for mixed chorus and organ was composed for the cathedral in Essen, Germany, where it was also performed for the first time during a festive mass on 22 May 2002. The deep spiritual meaning of the text is expressed very effectively via a minimalist texture. Monophonic plainchant alternates with homophonic and polyphonic passages, interconnected by sections for organ. Noticeably different are the Two Lullabies (Zwei Wiegenlieder) for voice accompanied by piano or an ensemble. They are intended for Christmas time, and in addition to the proverbial peace and tranquility of the season engage the listener with their melodic style, whose origin may be traced to traditional Estonian folk music. Old runic songs going back to pagan times in the early Middle Ages mingle here with Christian culture and Slavic customs. Many songs have retained their distinctive form through the ages; in the eighteenth and nineteenth centuries some were fitted with new texts from Lutheran codices and served henceforth as sacred songs. Pärt’s Lullabies, too, show traces of this age-old heritage, and in these short but masterful pieces we can admire that charming melodic style, with a nostalgic waft of times long past and a pleasing mood of Christmas tranquility.